Tiger Woods enters the championship round tied for sixth place after a strong third-round performance. ST. LOUIS – Tiger Woods knew the shot was good. He struck it pure from 240 yards on the 17th hole and started strutting down the fairway, watching the ball land 20 feet from the pin — one good putt away from an eagle that would have vaulted him into second place. And Woods knew the putt was bad. He muscled it 3 feet past the hole, then pulled the comebacker off line and, after settling for a disappointing par, he briefly grabbed the putter with both hands, as if to bend it, before deciding better of it. That par was the most disappointing of the 10 straight Woods made to finish his third round Saturday at the PGA Championship. He shot 4-under 66 to reach 8 under. That was four back of leader Brooks Koepka — well within striking range, but not as good as it might’ve been. For the third straight day at the wide-open, squishy Bellerive Country Club, Woods hit the ball well from tee to green — he hit 15 greens in regulation — and looked every bit the contender he was three weeks ago at the British Open, where the cheers seemed louder and more heartfelt than they’d been in the past. It’s been much the same this week in St. Louis. “Hearing the crowd, and Tiger’s performing great, it was like turning back the hands of the clock,” said Stewart Cink, who played with Woods and also shot 4 under to also finish four out of the lead. But Tiger’s putter? It brought more moans than cheers to the fans, and more frustration than joy to Woods. He has not made a putt of longer than 17 feet over three days, and has only made five putts of more than 10 feet all week. As Saturday’s round wore on, he was consistently coming up short as the already soft greens got even slower; he had six birdie tries of 20 feet or less over the back nine and didn’t make one. But it doesn’t mean he won’t have a chance to catch Koepka, who got to 13 under before he showed glimpses of a struggle — making back-to-back bogeys on 14 and 15 to come back to the field. Koepka closed with a two-shot lead over Adam Scott, with three more players at 9 under separating Koepka from Woods. 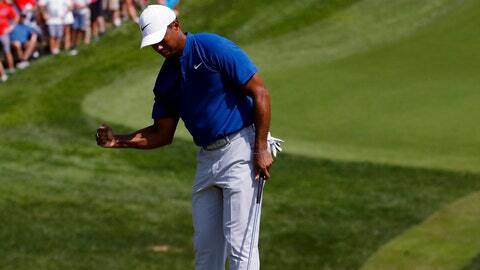 “The golf course is playing soft, it’s gettable, you have to make birdies,” Woods said. He did just that over the first nine holes, making five birdies on the front nine on the way to a 31 that drew him within two of the lead. What followed was another chapter in a consistent trend: Woods has played the front nine in 10-under par this week, but has played the back at 2 over. This year? He ranks 120th in back-nine scoring average on the PGA Tour, and is tied for 10th over the front nine. At the British Open, he shot 34 over the front nine in the final round to briefly get into the lead. He went double bogey-bogey on 11 and 12 to fall out of the lead and finished tied for sixth. But his experience on the back nine at Bellerive was different, in part because of storms that took him off the course in the middle of his second round Friday and brought him back for a 7 a.m. restart Saturday. In all, the 42-year-old Woods put his surgically repaired back through 29 holes over 10 hours in hot, sticky weather. He not only changed shirts this time, he changed colors — from a gray-and-white striped design early in the round to royal blue from the fifth hole on. But not a lost day. After finishing tied for 48th after the first round, then tied for 19th after the second, he is tied for sixth going into the last. Hitting the ball well and in the hunt. Now, if he can only get the putter to cooperate.